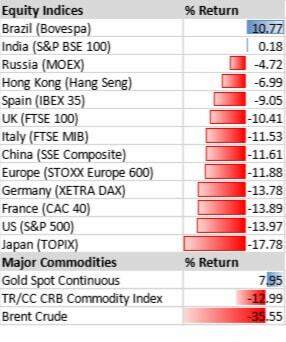 It was a brutal end to the year for global equity markets with virtually all major markets suffering sharp declines. Japan was hit particularly hard declining by just under 18% over the final three months of the year. The US, which for most of the year has been one of the better performing markets, also suffered significant selling pressure and ended the quarter down by close to 14%. It was a similar picture across Europe, with the Pan European STOXX 600 index declining 11.9%, whilst the UK’s FTSE 100 fared only marginally better with a decline of 10.4%. The sharp reversal in the final quarter left most markets posting losses for 2018. The FTSE 100 declined by 12.5% over the course of the year, whilst the S&P 500, and STOXX 600 indices declined by 6.2%, and 13.2% respectively. The Japanese TOPIX index lost 17.8% over the year and Chinese equities were hit even harder with the Shanghai Composite index down by over 24%. It does appear that the pace of global growth is beginning to moderate. So too are corporate earnings, which in recent years have enjoyed double digit growth in many regions and particularly in the US, which is still the worlds primary growth engine. There are also numerous geopolitical tensions preying on investors’ mind. The US China trade dispute is clearly a major concern with ramifications far beyond the two countries involved. As we write, the US government is in shutdown and the UK parliament is preparing to vote on the government’s Brexit plan. Meanwhile in France, any hopes that president Macron could push through much needed economic reforms now look increasingly unlikely given the wave of protest and social unrest we have seen over recent weeks. Germany, who’s economy is slowing, faces the prospect of a new leader for the first time in over 13 years when Chancellor Angela Merkel steps down in 2021. So, it is not difficult to see why investors may have been more inclined to sell in recent weeks. With these numerous dynamics in play we would not be surprised to see the elevated volatility we have witnessed of late continuing over the coming months. The key question facing investors, is how much of this political uncertainty, slowing growth and easing of forward earnings estimates described above, is already factored into the price. Markets have clearly repriced risk over the last quarter, and now trade much closer to, and in many cases below their longer-term ratios on several metrics. So, at the very least it could be argued that they are now more conservatively priced and therefore, any improvement in the forward outlook or even just a little more clarity on certain issues, could well see equities recover some ground.